The concept of narrative has been brought up in our intellectual discussions almost daily so far this semester. The ideas of story, experience and sequence that play such integral roles in writing are just as relevant to the design process at both the architectural and urban level. Given the brevity of our workshops in the past eight weeks, we have not had the time to conceptualize and produce actual buildings, but rather we have focused on telling a story, and creating a moment, both at the urban scale. With our arrival to Shanghai, we can now experience physical manifestations of narrative frameworks at the architectural scale, via the 2010 World Expo. A collection of pavilions, each showcasing the cultural and developmental growth of a single nation over the past decade, provides dozens of narratives through which we can experience the different countries. But how do we begin to understand the intent of these different pavilions, and furthermore measure the success of the narrative that they are striving to create? First, I think it is necessary to understand that narratives are born from a specific view of the creator. We as architects can never design with the belief that any and all will experience our work as we intend them too. Inevitably we are forced to implement our own attitude when forming the narrative of a building or scheme, which often is most appealing when done successfully. Wong Kar-Wai’s Fallen Angels is a respectable filmic example of this, and shows how the director was able to package the entire city of Hong Kong into a specific identity. Shot almost entirely in mega close-up view, the backgrounds of most shots are blurred beyond distinction, and coupled with the extensive use of indoor settings, the film creates a suffocating and confined atmosphere, elucidating the mental strain that we identify Hong Kong with. This vision of Wong Kar-Wai’s is merely one aspect of how the city could be experienced, but it is thought out and executed with precision. Paradoxically, the notion of narrative as a particular attitude is somewhat distorted in some of the pavilions I’ve visited thus far at the expo. The ingredients are there (big name architects, multiple programs, spatial sequencing) and the stage is ripe to wow the mass audiences in attendance, yet something was still missing. 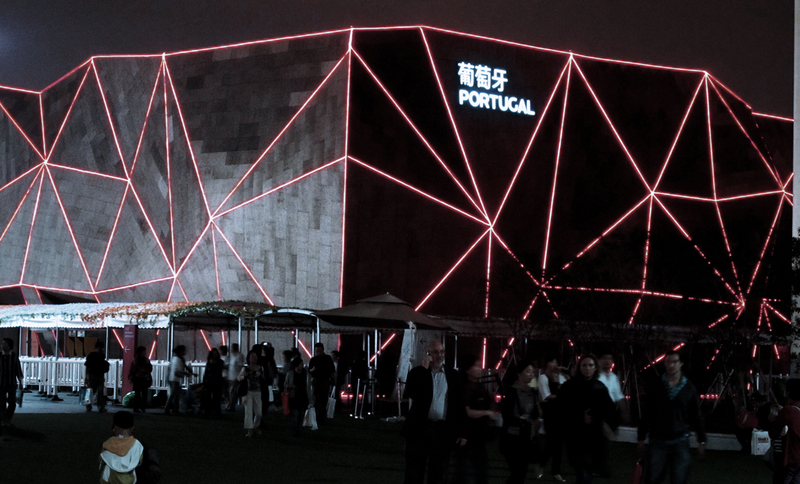 Perhaps the fact that the pavilions are trying to present a holistic view of their nation, and highlight multiple facets of culture and industry prevents a focused narrative from occurring. An attitude about what story they are trying to tell is absent, and an unconnected collection of information remains. Ones that have chosen an aspect unique to their nation and used it to drive the narrative have been more successful. Portugal for example, the largest producer of cork, used this characteristic as a catalyst. Starting with a cork exhibit, moving to a film which details cork production among other information, and ending with cork products for sale, there is cohesiveness to the experience. The exterior paneling was also made of cork to top it all off. Ultimately, the key to creating an interesting narrative lies in the calibration of a spectrum, from which a specific aspect can be conveyed. If Wong Kar-Wai’s Fallen Angels had been shot from multiple camera lengths, and in a mixture of settings, it would not have achieved such a powerful affect, and the narrative would end up a more general representation of the entire Hong Kong spectrum. Granted it is a challenge to “package” an entire nation into a small exhibit, I think it is worth the effort to narrow the story that the pavilion is trying tell, even if this means sacrificing some of the larger picture that many seem to focus on. I hope I will find examples of this in the final days of the expo.